Tom Moores. Pic by Mark Fear. 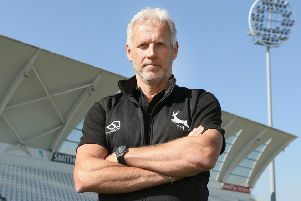 Tom Moores was frustrated following Notts Outlaws’ 13-run defeat to Worcestershire Rapids in the NatWest T20 Blast at Trent Bridge. The Nottinghamshire wicketkeeper finished with 26 not out from nine deliveries at the end of the reply, which fell short of the 209 target. Chasing a fourth consecutive win, Notts found themselves pegged back after an aggressive start and could only post 195 for five. Riki Wessels made 49 and Alex Hales scored 44 in the chase but John Hastings proved to be an effective match-winner for the Rapids, taking three for 31. Moores said: “Frustrating is the word but I think T20 goes that way, we couldn’t have asked for a better start (in the chase) but then the game got away from us and we probably didn’t get as many boundaries as we would have liked in the middle overs and then left ourselves with too much to do at the end. Earlier, 60 from Joe Clarke and a punishing sixth wicket partnership of 60 in just 4.2 overs helped push the Rapids up to 208 for eight, after being asked to bat first. Clarke scored his runs from only 27 deliveries and hit seven fours and three sixes to get the visitors off to a flying start, which took them past 50 inside just four overs. After Notts had fought back strongly Ross Whiteley and Mitchell Santner took it away from them again with some destructive hitting. Whiteley, who hit six sixes in an over against Yorkshire on Sunday, cleared the ropes on five occasions in making 42 from just 16 balls. New Zealand’s Mitchell Santner also showed his big-hitting prowess with three maximums of his own in making 35 from 20 balls. Santner clubbed one of his rope-clearing blows off countryman Ish Sodhi, who took two for 41, including the prized scalp of Whiteley, who skewed the leg-spinner to point. Jake Ball had earlier removed Clarke and then added some lustre to his final figures of three for 34 by removing both Santner and Joe Leach as the innings drew towards a close. In contrast, Harry Gurney came in for some punishment and conceded a total of five sixes as he finished with an analysis of none for 57, the most expensive in the county’s T20 history. Notts had never chased down a target as large as 208 before but enjoyed an explosive powerplay to set them on track, rattling up 76 without loss. Hales scored 50 of them, reaching the landmark in just 22 balls, with 12 fours – seven of them coming from eight consecutive deliveries bowled at him by Jack Shantry. With the game moving decisively away from them they were given a lifeline when Hales went after Brett D’Oliveira but failed to clear Ed Barnard on the deep midwicket fence, with the score on 92. When Brendan Taylor found 18-year old debutant Pat Brown on the midwicket fence, off Daryl Mitchell for 25, Notts still needed 80 from 46 balls. Outlaws captain Dan Christian made only two, hoisting fellow-Australian Hastings down to Clarke at long leg. The required run-rate rose to more than over 13, with 66 needed from the last five overs and home chances dipped further as Samit Patel became Hastings’ second victim, pulling to midwicket for 10. On 44 Wessels reached 4,000 runs in T20 cricket but he perished shortly afterwards and despite Tom Moores and Steven Mullaney throwing the bat in the closing overs the damage had already been done. The loss was the first sustained at home by the Outlaws since May last year, a run of seven wins and two abandonments, which leaves them on six points from as many matches in this campaign, whilst the Rapids’ win lifts them up to three points.